The German Historical Institute in Rome (DHI Rome) is the oldest of the historical research institutes of the Federal Republic of Germany abroad. It is dedicated to history and the history of music from the early Middle Ages to the present day, with particular focus on Italy, southern Europe and the Mediterranean area. Since 2002 it has been a member of the Max Weber Stiftung – Deutsche Geisteswissenschaftliche Institute im Ausland (MWS). As part of a dense cooperation network, an affiliate of MWS and member of the International Union of Institutes of Archaeology, History and Art History in Rome, the DHI sees itself as an important actor in the internationalization of research in the field of humanities; its activities are supported by a scientific council of nine members from German, Italian and Swiss Universities. - scientific consultation and support for researchers and institutions at both national and international levels, while also providing a large specialized library. The DHI sees supporting new generations of scientists – students, PhD students and postdocs – as one of its fundamental tasks, especially within the Italian-German context. To that end, the Institute offers a wide range of opportunities, such as internships and courses of study, summer and winter schools, scholarships to finance periods of research in Italy, fixed-term positions for scientific collaborators, and the Ludwig and Margarethe Quidde Fellowship for young outstanding scientists who wish to qualify for a university teaching position. 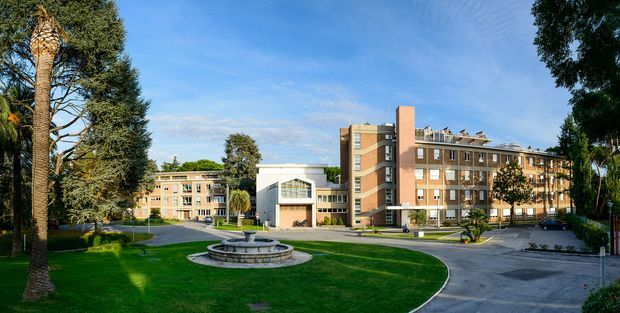 The DHI, founded in 1888, considers itself to be a bridge between German and Italian scientific worlds and a forum for international academic exchange. In the 19th century, as a place of science, Rome had already become an extraordinary laboratory for internationalisation in general humanities research and in particular in that of historical orientation. Even before the First World War four German institutions, the DHI, the German Archaeological Institute, the Biblioteca Hertziana and the Roman Institute of the Görres Society, all still in place today, were founded alongside other international and Italian research institutes in the "Eternal city". After the Second World War, the International Union of Institutes of Archaeology, History and Art History in Rome was born. Together with the Union, the Max Weber Stiftung affiliate institutes, and numerous other cooperation partners, the DHI dedicates itself to research and the dissemination of scientific findings beyond the confines of national, linguistic, historic and disciplinary boundaries. It does so by promoting projects, publications, conferences, workshops, lectures and exhibitions. Given the extraordinary wealth of documentary traditions and historical resources, as well as the dense presence of international research institutions, Rome clearly thrives in this respect. To present its research, the DHI publishes, in collaboration with internationally renowned publishing houses, a scientific journal, two musicology series (one dedicated to studies, the other to editions), and various historical series in German and Italian. The Institute aspires to a firm open access policy. A large part of the printed publications is made accessible online instantly or after a given period. Thanks to the Institute's dedication in the field of digital humanities, the number of online publications has grown considerably, above all in the form of editions and databases. The Institute's scientific collaborators offer advice, support projects and research and supply information from Italian archives and libraries; in particular they help Italian researchers to organise research stays in Germany, initiate collaborations and draw up project proposals. A fundamental service supplies the library with its holdings of around 245,000 books and around 850 ongoing periodicals. This includes important musicology and historical resources whose central themes attract researchers from all over the world.